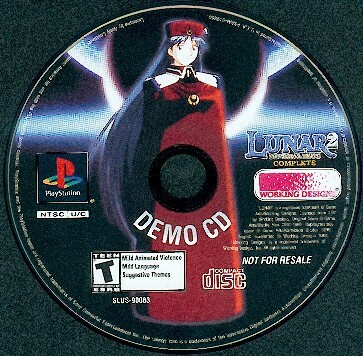 Three demo CDs for the LUNAR series have been publically released. One in Japan and two in North America. 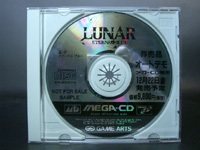 The demo CD released in Japan was a kiosk display of Lunar: Eternal Blue on the Mega CD. It is extremely rare to get ahold of, and up until February 2005, we weren't even sure it existed. However, one popped up on Ebay, and we were able to get a screenshot of the disc art. Unfortunately we didn't realize it was on Ebay until it was already sold (for freakin' 13 bucks!) and the buyer wouldn't sell it. Nor did the seller have any more copies. Doh! So if anyone has any more information on the disc, we would love to publish it! Just contact us. Below are screenshot comparisons between the demo and the actual game along with the disc artwork. Below that is some information and pictures of the North American demo discs. The other two demo CDs were released by Working Designs here in America. 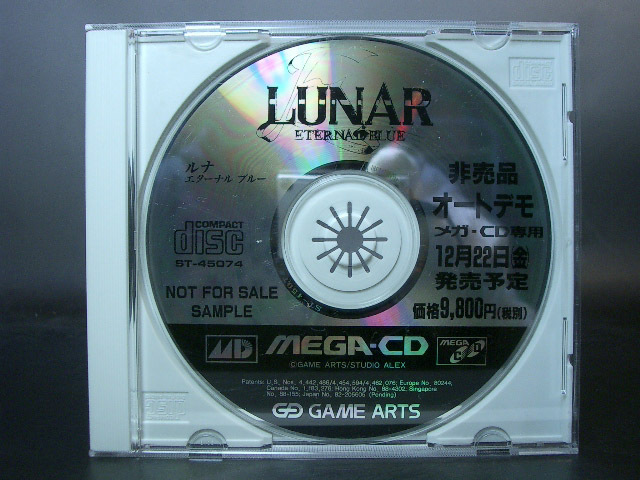 The first was a demo of LUNAR: Silver Star Story Complete for the Playstation, and was given as a pre-order special. We have scans of the demo cover and CD artwork below the EB demo pictures. The second demo was for LUNAR 2: Eternal Blue Complete. It was released inside the package of Vanguard Bandits, a strategy RPG by Working Designs for the Playstation. We have scans of the disc and cover of that as well.